Stuck at home with a broken toe & I am so done with staring longingly outside through the window - I want to partayyy, sigh! Can hardly walk regularly yet, much less hit the dance floor & shake a leg. But I'm done feeling sorry for myself (& don't you get started), so what if I can't have a party, I can still rustle up a pretty amazing party starter that's sure to get the taste buds waltz-ing, or salsa-ing, or whatever's your favorite dance :) & nothing better than the ubiquitous Spring Roll to get this party started. As all you party people know, these golden-brown cuties are best eaten crispy and hot, with the steam flowing out of the spring roll as you take a bite - but careful, don't burn your mouth! Ooooo, the yummy taste that spreads in your mouth is beyond compare. Ready? Let's rock & (spring) roll! In a small bowl, combine the soy sauce, sugar, chilli garlic sauce, black pepper, vinegar & sesame oil. Set aside. Heat the oil in a wok over medium heat. Add the garlic & ginger & saute for a minute. Add green onions, carrot, cabbage, bean sprouts. Stir in the soy sauce mixture. Mix well. Turn the heat to medium-high. Saute till the liquid evaporates from the mixture (around 3-4 mins) while stirring constantly. Remove from heat & allow to cool. In a small bowl combine the all purpose flour & water. Keep aside. Pull the wrapper corner closest to you over the filling to cover it, and tuck it tightly under the filling. Roll upwards till you reach the center. 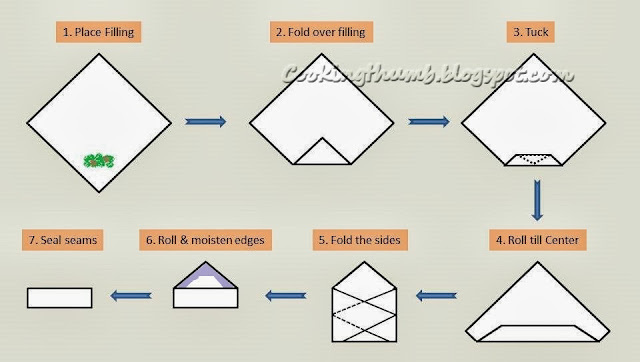 Now, fold over the sides such that the edges are straight, and continue to roll upward. Moisten fingers in the flour mixture, and brush wrapper seams to seal. Place it on the baking sheet, seam side down. Brush the roll with oil. Cover with a damp cloth. Repeat with the remaining wrappers and filling. Arrange spring rolls in a single layer on a baking sheet. Preheat the oven to 425 degrees. Bake for 20-25 minutes until golden turning the rolls halfway through. Remove from oven. Allow to cool for 4-5 minutes & serve hot with your favorite sweet Chilli sauce. You can find Spring roll wrappers in the freezer section of almost any Asian Grocery store. Hope u get well soon & do real dancing with the spring rolls.. Lovely write up & a fab click.. Me too a die hard fan of the yummy spring rolls ! I've always steered away from making spring rolls at home because I hate deep frying anything but will definitely have to try your recipe and baking them instead! Laura, I agree - I hate deep-frying too. IMHO, these baked spring rolls taste better than the deep-fried version. Hope you get to try them soon & do let me know how they turn out :) Happy Cooking!! I love that they're vegetarian! Do these freeze well? It's just my boyfriend and I, and I would love to have easy side dishes premade for stir-fry night! Athena, sorry for the late reply. I haven't been well for the past few weeks so haven't kept up with blogging. My hubby & I prefer fresh-made food, so I have never tried freezing. However, it should be Ok to freeze the unbaked spring rolls. I would suggest that you freeze them individually on a cookie sheet (or something) such that they do not touch each other. If you pack them together and then freeze, they will become a solid block and the wrapper would get damaged when you try to separate them. Hope this helps!! Not at all late, thanks for responding. We enjoy fresh made as well, but lately I've had a lot of late nights at the office. Been trying to find healthy fillers for those nights. Stir fries are quick/easy, but the sides not so much. Thanks for the suggestion. Guess I'll try and let you know if I do! It's a lovely recipe and I'll sure try it soon! Hi there! Loved your choice of ingredients and the clear instructions in your recipe; my spring rolls turned out so awesome yesterday that I'm making them again today. :) So thanks a bunch and greetings from the Netherlands! Hello! I have made these SEVERAL times. Love, love, love them!